60188 PER5397.jpg 500X638\PER5397.jpg 60189 PER5397_1.jpg 500X638\PER5397_1.jpg Send A Hint! 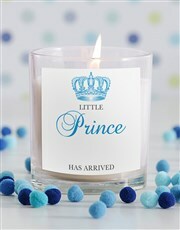 Herald the arrival of a baby with a little prince new baby candle. 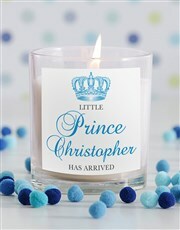 This candle has a delightful vanilla scent and can be customised with the name of the baby in mind. Give this as a special keepsake to new parents or order one to commemorate your own milestone. Buy personalised gifts online today for delivery anywhere in South Africa. Get this Little Prince New Baby Candle delivered with NetFlorist.